Forget about getting these great prices in August when the Edinburgh Festivals are on. During the festival season, prices in Edinburgh go through the roof. Set in University halls of residence or dorms, 2000 rooms are available during spring break and summer vacations. Accommodations are close to Arthur's Seat and about a mile from the city center and Waverley Station. 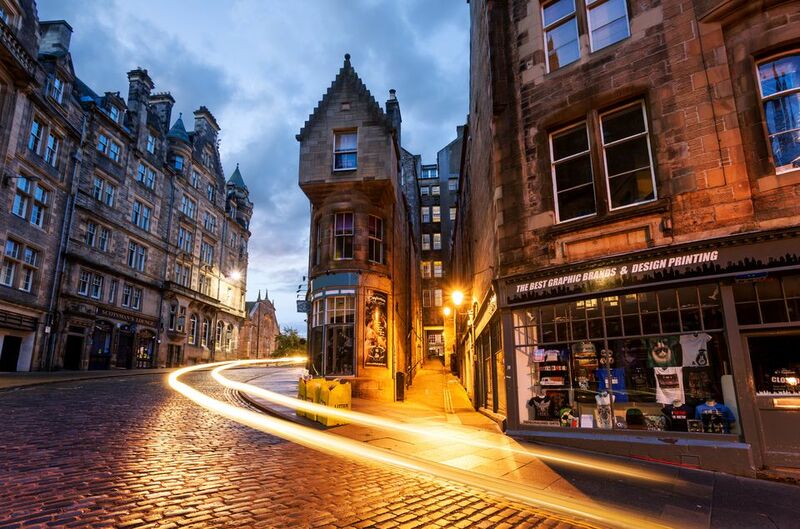 The Grassmarket area of Edinburgh is central and popular with students, visitors, and locals - so don't expect a quiet night. This hotel has 45 rooms with private bath, television, tea and coffee making, hairdryer and telephone. Breakfast is not included but is available in the adjoining pub. If you join their mailing list you become eligible to try for "Mates Rates" - the ten rooms per month they sell for £1. They announce the £1 rooms through emails and then if you're very quick you might get one. The hotel is about 5 minutes from Waverley Station. There's no parking but a discount rate at a nearby car park is available. You'll either love or hate the cheap rooms at the Ben Doran Guest House. Located in a listed Georgian townhouse with period features, it's near the center and promises Gilchrist&Soames toiletries, extra large towels and dressing gowns (on request). There's free off-street parking, Wi-Fi for a small fee and a full Scottish breakfast included in the price. Some guests have complained that it's cold - but most Edinburgh Georgian houses are. It's a fine old Scottish tradition to snuggle up under a feather duvet with a hot water bottle to warm the bed. The hosts at Ben Doran will provide both. Only two minutes walk from Princes Street and five minutes from Waverley Station in the center of Edinburgh. The Ballantrae is a late Georgian house, built in the 1830's with many original features. Keep in mind the exceedingly low prices when considering this hotel's claim of "luxury" accommodation and self-catering suites. The hotel has been upgraded and a 2014 refurbishment brought this Grade 2 listed hotel up to 3-star standards. The location is great - the new Edinburgh Tram straight to the airport stops right outside. You can't beat the price and the handy location. This purpose-built hostel in Edinburgh's Old Town has more going for it than many so-called three-star guest houses. Dorm-style rooms for ten to 12 people cost £9 per night, but you can also book a private, twin-bedded room for less than £40, or a family room for four at £60. All rooms have en-suite shower and toilet, towels and bed linens, lockers and lots of security features - from safe mobile phone charging to save cycle and baggage lock ups. There are also special girls-only rooms, with extra features such as hypo-allergenic duvets and pillows, luxury towels, shampoo and hair conditioner, full-on hairdryers and full-length mirrors. All in all a good deal for students, backpackers, families and independent travelers. Right on Princes Street and near Waverley Station, the Royal British Hotel is in the heart of the action - and the noise- for Hogmanay and the Edinburgh Festivals. At this old-fashioned, traditional hotel, expect big, clean rooms with slightly dated decor but reasonable bath/shower rooms. High-speed Wi-Fi and 24-hour room service is available. Premier Inns are a national chain of budget hotels with a reasonably good reputation for cleanliness and convenience. Rooms are large, air-conditioned and simply furnished with desk, telephone, television, tea and coffee making facilities, private bath and power shower. Family rooms are available and breakfast is not included. The Leith Waterfront area of Edinburgh is becoming very trendy - with some of the city's best restaurants located there. This group often advertises ridiculously low lead prices - £29 - £49 - on their website. Don't be seduced by them because you could spend a lifetime changing dates on their reservation widget looking for the limited number of rooms offered at that price. Still, their normal prices are pretty good value for a stopover while touring. Even closer to the heart of things, Premier Inn's Edinburgh Haymarket is a seriously good deal. Don't be put off by the location next to Edinburgh's bus station and five minutes from Waverly Rail Station. The Elder York B&B is housed in a well located, Grade A listed building and, while basic, offers reasonable value for money. Do remember to ask for a private, or ensuite bath because most - but not all rooms have them. And one more proviso - the B&B occupies the third and fourth floor of the building, with no lift/elevator. So if you're not up to hoicking your luggage up all those stairs, this one's not for you. The French economy chain Ibis can be counted upon to be reliable and clean, if a bit boring. This one is a rather nice example. It's well located not far from the airport, near public transportation and beside a loch. There's free Wi-Fi access and 24/7 snacks and drinks. Breakfast isn't included but parking on site is free.